Demon of Hatred in Sekiro is an optional boss that you can fight if you make the right choices. 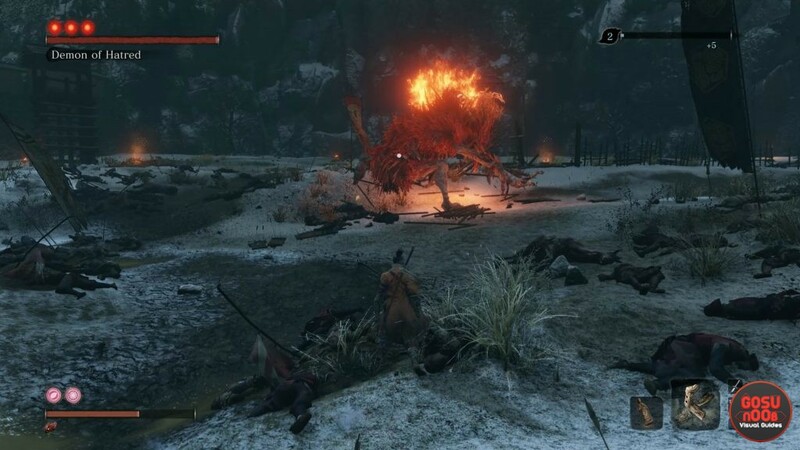 The Sekiro Demon of Hatred boss is definitely one of the most brutal enemies in the game, and comes with a lot of emotional baggage, too. The catch is that it’s extremely well-hidden, and extremely easy to miss. With all that said, welcome to our Sekiro Demon of Hatred Location – How to Spawn Optional Boss guide to show you where to find the boss, when it spawns, some general tips on how to beat it, what to do after the Demon of Hatred battle, and more. Before we head even a step further, a warning: THERE WILL BE MASSIVE END-GAME SPOILERS IN THIS ARTICLE. Proceed at your own risk. How to Spawn Demon of Hatred Boss in Sekiro – When Does He Appear? To spawn the Demon of Hatred optional boss in Sekiro, you’ll have to push through the story until you reach the (very) late game. And even then, Sekiro Demon of Hatred spawns only if you choose to abandon the Iron Code, side with Kuro, and turn on the Great Shinobi Owl. So, if you went with the Shura ending, you can forget about this boss. After the battle with the Shinobi Owl, you can go and talk to Kuro, and he’ll give you tasks to complete. Push further through those missions (which are essentially story missions). Eventually, the ministry will start attacking the fortress. You’ll know this is happening, because the whole place will be on fire, and nearly all Sculptor’s Idols will be grayed out. The location of the Sekiro Demon of Hatred through a Sculptor’s Idol in Ashina Outskirts. You’ll have to get there on you’re own, what with the grayed-out idols and whatnot. We’re going to start at the Kuro’s Room idol. From there, head through the window on the left of the samurai armor. Drop down the rooftops until you reach the bamboo “bridge”, then head forward towards the burning tower. Hop over to the lower part of the roof. When you reach the corner, drop down to the ground, and speak with the NPC. Look to the left and above of the NPC. Grapple up there, then to the corner of the roof, then up and to the left to the top of the building. Off into the distance, you’ll spot the shinobi kite that the aforementioned NPC mentioned. Make your way towards it, and use the kite to proceed further. From the next rooftop, hop over to the smaller rooftop of the guard tower, and speak with the dying NPC. Now, cross the bridge, and grapple to the branch to the left, then onto the platform above. Run across it, and hop to the lower roof on the right, go through the hole in the wall, and to the other side. Run to the right, around the fence, and basically just continue to stick to the right, until you reach the fort with a black-and-gold banner. Grapple inside, and then turn right, and walk through the burning gateway. We’re almost there. All you have to do is to go through the courtyard, towards the huge, blazing gate. There’s a Sculptor’s idol on the ground in front of the gate, right in the middle. Approach the idol, and commune with it. This will transport you into the arena where you’ll have to battle the Sekiro Demon of Hatred boss. And good luck with that. How to Beat Demon of Hatred in Sekiro? To beat the Sekiro Demon of Hatred boss, you’ll have to treat it as you would any Dark Souls and / or Bloodborne boss. In broad terms, you have to stick as close to the boss as you can. Learn its moves. Dodge, run, and jump as necessary. Measure your attacks, and don’t get greedy. One or two hits per opening. And, of course, arm yourself with patience, because you’re in for a really rough ride. In the first phase, the two attacks to pay attention to are the sweep attack that you have to jump over and to the right, and the jumping attack that you can counter by jumping and grappling the boss. The other attacks are pretty uniform, if brutally punishing when they connect. In the second phase, look out for the attack that comes after he charges his fire arm. Run like hell from that one. Lastly, in the third phase, he’ll do an attack with two sweeps that will create a ring of fire. This attack will require two well-timed jumps, and the symbols will notify you of that. This all sounds much easier than it actually is; again, good luck with this. When you defeat the Demon of Hatred, you’ll get the Hatred Demon memory (you use Memories to increase attack power), and two Lapis Lazuli. Where to Go after Demon of Hatred? After you kill the Demon of Hatred, you basically just have to proceed through the game normally. See, the Sekiro Demon of Hatred boss is completely optional. So, just use the idol that you arrived through, and travel back to Ashina Outskirts, or as close to Ashina Reservoir as you can. Your aim is to go back to the area where you took Kuro in the very beginning of the game, where you first fought Genichiro. The only difference is that everything is in ruins, so you’ll have to go around, across rooftops and the like. Can I Fight Demon of Hatred after Last Boss – How to Reach? Yes, apparently you can still fight the Demon of Hatred boss in Sekiro, even after the final battle; so long as you don’t dive into New Game +. The same basic steps that we’ve discussed above apply. You might not be able to start from the Kuro’s Room idol, so you might have to work around that. Use your grappling hook to traverse the rooftops, and keep an eye out for the shinobi kite. From there, the way is basically the same. That said, there is a word of caution to be said here. Some people have been reporting that the idol at the burning gate, the one that transports you to the Demon of Hatred, doesn’t necessarily spawn after the final fight. So, ideally, you should fight this boss before you go ahead to the ultimate confrontation.